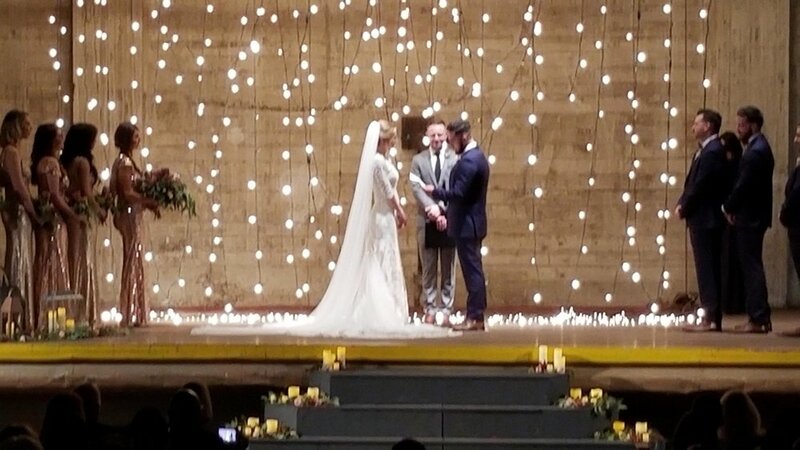 Libby and Matt were married on the stage on January 19, 2019. It is the first wedding in the theatre in 91 years! It was a beautiful event with 190 guests attending. Flawless and stunning, the event will be remembered for years to come. On December 7, 2018 the Lompoc Theatre Project opened the doors for parade goers. Before and after the annual parade, hundreds of families wandered through the historic building and saw the progress we are making. Eggnog and snacks were enjoyed by all. We even showed White Christmas on the movie screen! Giving Tuesday is a national campaign to raise money for great causes. Participating for the first time, we aimed high. Although we did not raise quite enough to replace the roof over our office spaces, we did raise nearly $4000 from online giving and the thank you event we held at the theatre on Novemeber 27. Thanks everyone! The Lompoc Theatre Project received a $15,000 grant from the Towbes Group of Santa Barbara. This group was instrumental in many large scale projects including the renovation of the historic Granada Theater in Santa Barbara. The money will used for repairs that will enable us to reopen the retail spaces facing H Street and bring monthly income to the building. Several tours have been organized through the fall, with monthly tours in the works. Hundreds have toured the building, seeing first-hand the wonderful project in all its phases. Look for the red, two-sided sandwich board in front of the theatre on a Saturday and Sunday and come on in! An intimate event with twenty-five friends and supporters, the Paella and Vino party was hosted by Alvin Cabral. The event raised several thousand dollars for the project. The Daughters of the American Revolution (DAR) and the Lompoc Theatre Project hosted a huge rummage sale inside the theatre. The first time the public had entered the building in nearly a year. Great success and raised much needed funds. When the Lompoc Theatre Project formed as a nonprofit organization six years ago with the lofty goal of restoring and reopening the historic Lompoc Theatre, one of its biggest challenges was to drum up support for the venture within Lompoc and surrounding communities. Those efforts were not wasted, according to a feasibility study commissioned this year by the organization. The Lompoc Theatre Project recently released the results of that study, which was based on surveys and questionnaires completed by 176 community members and 11 representatives of industries categorized as stakeholders in the project. The study concluded that there was overwhelming support for the project locally, and, despite some key challenges still remaining, a majority of community members believe that the renovation is viable, with 81 percent of respondents “optimistic” about its success. Mark Herrier, an actor and president of the Lompoc Theatre Project’s board of directors, said he was encouraged by those results. “It’s been a long, hard journey to get to where we are today, and [the journey] was made longer and harder because of the past history of the previous attempts to renovate the theater,” Herrier said Monday. “Some of them did not go well in the public’s eyes, and it took us many years to overcome those bad feelings. Four years after forming as a 501c3 nonprofit in 2012, the Lompoc Theatre Project officially took over possession of the theater property, located near the intersection of East Ocean Avenue and North H Street. The group went on to develop a 450-person volunteer base, a 10-year donor list, and attracted a Facebook following of more than 2,000 people. Each of those achievements, as well as the high-visibility downtown location, was included in the study findings among the “positive internals” for the effort, which aims to bring live entertainment, movies and other events back to the theater that first opened in 1927 but hasn’t been used regularly since the 1990s. The study, which was conducted by Strategic Vitality LLC and funded in part by a $5,000 grant from the Santa Barbara Foundation, also painted a picture of high external support of the project from the community. Eighty-seven percent of community members strongly supported the renovation and believe that Lompoc residents and nonresidents would also support it. Additionally, the study found no indications that previous unsuccessful attempts to restore the theater by other groups posed any threat to this current effort. Herrier said he was encouraged but not shocked by those findings. A significant portion of the study focused on the financial feasibility of the restoration, which the Lompoc Theatre Project has estimated will add up to about $6 million. The organization reports that it has raised about $200,000 so far, with the largest single donation coming from actress and Santa Barbara County native Julia Louis-Dreyfus, who is perhaps best known for her role on the hit TV series “Seinfeld,” and her husband, writer/director Brad Hall. The study noted that developing relationships with other wealthy locals could be critical to the restoration. It reported that Santa Barbara County had the 11th highest concentration of millionaires in the state, with one out of every 227 tax filers. Billionaires who either live or have a significant presence in the county that were mentioned in the study include Oprah Winfrey, Tom Barrack and Elon Musk. The study reported that 91 percent of those surveyed and all of the interviewees said that funding from outside Lompoc will be "important" or "very important” for the project’s success, with few thinking that the money could be raised in Lompoc alone. Seventy-five percent of interviewees thought $100,000 to $1 million should already be in a “launch fund” at start-up. The study also reported potential challenges to the group’s fundraising efforts. The study noted that the Lompoc Theatre Project’s capital campaign will be competing with other organizations for annual support and grant funding. Since those other organizations will include political campaigns both this year and in 2020, the study reported that the Lompoc Theatre Project needs to avoid polarization, which it reports has never been higher in the U.S., and that board members and supporters will “have to walk a fine line” regarding partisan politics. The Lompoc demographics also present challenges, according to the study, which noted that some of those same challenges could also open up opportunities. For example, the fact that Lompoc is a “small town” and has average annual household incomes of less than $50,000 and per-capita incomes of slightly more than $20,000 can be leveraged to create strong “needs statements” for public and grant funding, the study notes, both for arts and cultural educational programs. At the same time, the study also points out that public support of the arts is on the decline, while private support is on the rise. While the study ultimately offered some encouraging indicators for the restoration, the project still primarily hinges on fundraising. “If we had the $6 million tomorrow, then we could open in a year and a half,” Herrier said. Over the past year, work commissioned by the Lompoc Theatre Project has included gutting out the entire auditorium, asbestos abatement and rehabilitation work on the roof. The downstairs office spaces have also recently been cleared out, and the group hopes to make those units available to renters as soon as this month. The upstairs spaces, which are currently used for meetings by the Lompoc Theatre Project’s board of directors, will be made available after the work on the roof is completed, Herrier said. He indicated that could be done before the end of the year. Members of the public will be able to go inside the old building and get up-close views of the changes during a mixer coordinated by the Lompoc Theatre Project and the Lompoc Valley Chamber of Commerce from 5:30 to 7 p.m. Thursday. Willis Jacobson covers the city of Lompoc for Lee Central Coast Newspapers. Follow him on Twitter@WJacobsonLR. Actress Julia Louis-Dreyfus and her husband, writer/director Brad Hall, have made the first major donation to the Lompoc Theatre Project, kicking off the nonprofit’s capital campaign to restore and reopen the theater, board members announced today. The Lompoc Theatre Project takes ownership of Lompoc Theatre! We at the Lompoc Theatre Project are beyond thrilled to announce — via social media, and at a news conference we just held— that we now own the deed to the historic Lompoc Theatre, built in 1927. Santa Barbara County Superior Court Judge Jed Beebe cleared the path Monday, Jan. 25, for the Theatre Project to take ownership of the theater when he granted the nonprofit’s petition to foreclose on the previous owner, Lompoc Housing and Community Development Corporation (LHCDC). During its annual membership meeting Sept. 22, the nonprofit Lompoc Theatre Project membership elected four new board members and renewed terms for two existing board members. The new board members are Lompoc residents Michelle Ball, Raymond Down, Jenelle Osborne and Nancy Shaw. Founding members Carol Benham and Jack Carmean, also of Lompoc, were also re-elected to continuing seats on the nine-member board of directors. Click the image below to view a PDF featuring concept art of the proposed makeover for the Lompoc Theatre.